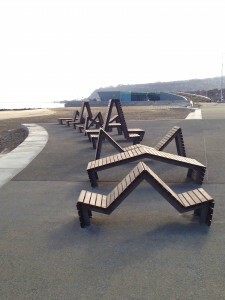 Goose Foot were selected by Freshwest Design to work together in producing ten eye catching seats and benches for the Colwyn Bay promenade, as part of the Colwyn Bay Waterfront Regeneration Project. The seat frames were laser cut and fabricated at our state-of-the-art factory in Darwen, UK, using 316 marine grade stainless steel and kebony syp timbers. The final fabrication, assembly and installation was undertaken by Freshwest Design. These bespoke seats were specifically designed to stop people in their tracks and provoke discussion from the general public. The Colwyn Bay Waterfront Project combines the renewal of coastal defences with regeneration improvements to the promenade, creating a modern, sustainable and attractive waterfront. 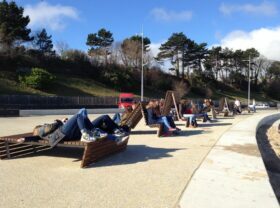 A key element of the project is the idea of circular movement – to encourage people using obvious road and pedestrian signs to travel along the promenade, up to the town centre and up to Old Colwyn near Parc Eirias. A large amount of the work we do involves regeneration projects with local councils and products designed by artists and architects. As an original manufacturer, we are able to custom-build street furniture to your specifications, in batch orders or as one-off bespoke products. Feel free to contact us to discuss your personal requirements, call us on: +44 (0)1254 700213, or e-mail enquiries@goosefootuk.com and see exactly what we can do for you!